So I'm sure you've all been dying to know where it is the Dude and I going for our 10-year anniversary trip/belated honeymoon. And I'm sure showing a picture of a pile of brightly-colored florals was oh-so-subtle, right? Well, you guessed it! We're going to Hawaii in couple months! I'm incredibly excited and spent the entire day last Saturday stitching up some new (to me) rags. Piece numero uno was found in a sad state for $2 at the local Goodwill. They shorts were brand new with the original tags still attached. But the elasticated back half of the waistband had lost all elasticity, which makes me wonder how long they'd been hanging unworn in someone's closet and/or the thrift store before I snatched them up. Step one in turning this sucker into a cute skirt was to cut open the inseam. After that, I was able to lay them out flat and pin (kinda hard to see the pins in this photo though) and sew new center front and center back seams. The original center seams had top-stitching, making it a little obvious where my new seams began. 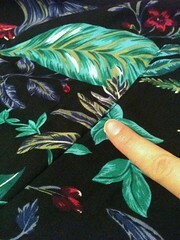 So I continued the top-stitching along my new seams to match. 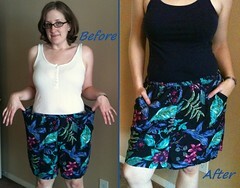 Finally, I picked out enough of the waistband to remove the stretched-out elastic and replace it with a piece of my own. 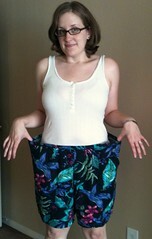 I even threaded my new elastic through the entire waistband, instead of just the back half. 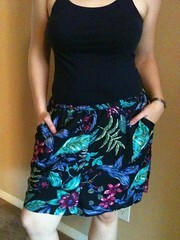 And now I have a cute skirt to go with my turquoise swimsuit (sadly missing in action during picture time). I even managed to snag a couple of Hawaii-ready dresses requiring no alterations - $3 each! Check back soon for some more vacation garb! Big News on the Knitting Front!